These photos were taken on the beach at Findhorn in north east Scotland. 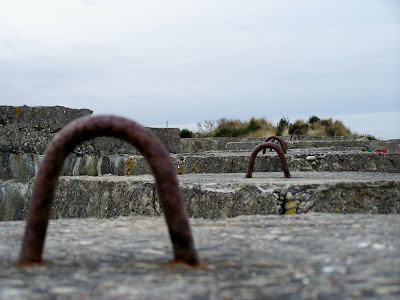 They're part of some old coastal defences which were put in place during WW2. I love it! not only do you have to knock the ball through the hoops, but you also have to make it leap wide crevasses. That should add some interest to the game. I love the color of the iron as it "puddles" around the hoops and the amazing purples! Excellent post! nice play, interesting perspectives you took with the photos. nice pics. Sure, I'll play. Pass me a mallet and I'll tee it up. 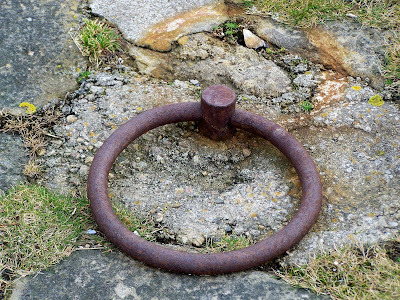 I love rusted metal. These go so well with the ruggedness of the rock. It's been years since I have played croquet, but I'd love to give it a try. Cool. They should put them on the Giant's Causeway in Ireland for added fun. 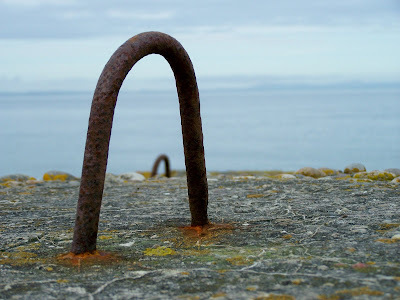 I love the colours in rusting metal - there's another photo in my next post, also taken on the coast in Scotland. Maybe the salt in the sea air aids the corrosive effect? They are indeed called hoops - I was quite disappointed that there wasn't a more eccentric word for them. I also found out that there are croquet world championships, also extreme croquet and a version played on bicycles!